Noam Elimelech, Chassidic essays on the Torah, by R. Elimelech of Lizhensk, with Likutei Shoshana and Igeret HaKodesh. Slavita: [R. Moshe Shapira, 1794]. Third edition. 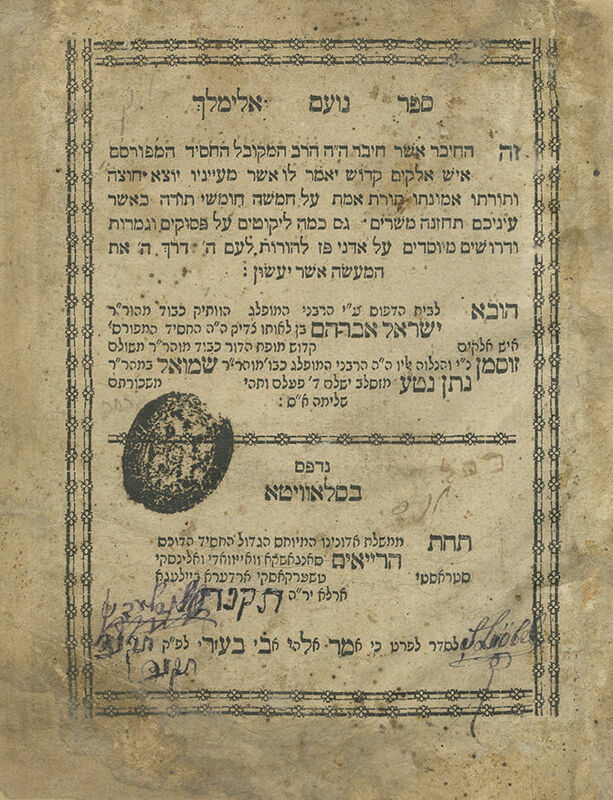 The publisher of this edition, R. Yisrael Avraham Rabbi of Cherny-Ostrov, was the son of R. Zusha of Anipoli and nephew of the author R. Elimelech of Lizhensk (Leżajsk). On the verso of the title page, three important approbations from Chassidic leaders appear: Approbation by R. Yaakov Shimshon of Shepetivka (who mentions in his approbation the printer R. Moshe Shapira); approbation by R. Zusha of Anipoli, father of the publisher and brother of the author (this approbation was first published in this edition, while in the first edition of Noam Elimelech printed in Lemberg, R. Zusha's approbation does not appear), and an approbation by R. Aryeh Leib, Rabbi of Volochysk. Following the approbations, the foreword by the author's son Rebbe Elazar Weisblum is printed, including noteworthy prayers that the blessings his father regularly accorded the Jewish people should be fulfilled. This foreword was omitted from some of the subsequent editions. Ohel Shlomo, biography of Rebbe Shlomo of Radomsk (part II, Piotrków, 1935, p. 31), cites that this introduction was particularly cherished by the Rebbe of Radomsk, the Tiferet Shlomo, "almost like the entire Noam Elimelech". The Rebbe also requested of printers to print the book according to the Slavita edition which includes this foreword. The Noam Elimelech was one of the first Chassidic books, and is considered until this day to be one of the fundamental works on Chassidism. The teachings were recorded by his son, R. Elazar, who showed them to his father and received his permission to print them. The book contains the essential part of the doctrine of R. Elimelech of Lizhensk on Chassidism, purity of thought and attachment to G-d. R. Elimelech had five disciples, who disseminated Chassidism to the Jewish people: the Chozeh of Lublin, the Maggid of Kozhnitz, R. Avraham Yehoshua Heshel of Apta, R. Izek of Kaliv and R. Mendel of Rymanów. Since its publishing, the book was deemed sacred to all, to the extent that his disciple R. Mendel of Rymanów stated that only on Friday after immersing in honor of Shabbat is one able to grasp a little of the pure and lofty thoughts it contains. The Maggid of Kozhnitz would not welcome the Shabbat before he had studied his teacher's book (Encyclopedia L'Chassidut, I, p. 236). He would say that R. Elimelech would appear – after his passing – to his disciple R. Naftali of Ropshitz, to teach him Noam Elimelech (Igra Debei Hilulei, Ashdod 1999, p. 250). The Divrei Chaim of Sanz once remarked that he could compose a commentary on the Noam Elimelech just like the Beit Yosef did on the Tur, since it contained such profundity (Igra Debei Hilulei, Ashdod 1999, p. 235). Rebbe Eliezer of Dzikov once saw in a dream a house full of books, he was told that one book was the Noam Elimelech, and all the other books the house was filled with were commentaries to the Noam Elimelech (Ohel Elimelech, p. 80, section 193). R. Izek of Kaliv, after writing several hundreds of papers of commentary to the Noam Elimelech, heard a Divine Voice asking how he had the audacity to write a commentary to the Noam Elimelech, of which even angels and other celestial beings struggle to understand even one word or letter (Ohel Elimelech, p. 80, section 194). This book was reprinted in numerous editions (until 1982, it had been printed in over 50 editions, and since then in dozens more). Many keep the book as a segulah, and some special miniature format editions were published to serve as amulets for protection and success. Many put it at the head of an ill person as a segulah and protection, for a speedy recovery and to be saved from any misfortune. This book is known to be a segulah for women experiencing difficult labor (several Jewish hospitals throughout the world have a Noam Elimelech placed in a velvet pouch in the delivery rooms as segulah for easy births). This segulah is already mentioned in Shulchan Melachim by R. Moshe Tzvi Landau of Kleinwardein, who writes in the laws pertaining to women giving birth: "And the custom of placing a holy book wrapped in a cloth under the head of a women in labor has already become widespread – and the custom is to place the book Noam Elimelech and Or HaChochma" (pp. 38b-39a, Beregsaz 1931 edition). The publisher of this edition, R. Yisrael Avraham Rabbi of Cherny-Ostrov (ca. 1772-1814), was pronounced by his father, R. Zusha of Anipoli, to have the soul of Chizkiyahu, king of Yehuda. A son-in-law and successor of R. Zev Wolf of Cherny-Ostrov, a foremost disciple of the Maggid of Mezeritch and leader of the Chassidic community in Tiberias. When his father-in-law immigrated to Eretz Israel, in 1798, he was appointed his successor. After his passing at the age of 42, his widow the Rebbetzin continued leading the Chassidim, managing the Tish like a rebbe (their mechutan R. Mordechai of Chernobyl attended her Seuda Shlishis when he spent Shabbat in their town). She was killed in the earthquake which devastated Tiberias in 1837, and was buried there close to her father R. Zev Wolf of Cherny. Their orphaned daughter was raised by R. Mordechai of Chernobyl and married the son of R. David of Tolna, bearing descendants who were the Rebbes of the Tolna dynasty. R. Yisrael Avraham also left behind four sons, one of whom was a son-in-law of R. Moshe Shapira, Rabbi of Slavita. Complete copy. 82, 84-150 leaves (mispagination). 19 cm. Condition varies, most leaves in good condition, several leaves in fair condition. Stains. Traces of past dampness in several places. Tears to title page, slightly affecting border and text on verso, repaired. Worming, damage and tears, affecting text, to several other leaves (title page and two subsequent leaves professionally restored). Ink inscriptions on title page and subsequent leaf. Censorship stamp on title page. New binding.